https://sep.yimg.com/ay/yhst-33477391359232/leaf-fish-scorpion-fish-taenianotus-triacanthus-leaf-scorpionfish-paper-fish-sailfin-leaf-fish-5.jpgLeaf Fish Scorpion Fish - Taenianotus triacanthus - Leaf Scorpionfish - Paper fish - Sailfin Leaf Fish Moderate, but VenomousSemi-aggressive20 Gallon3.9 inchesYes, with CautionCarnivoreIndo-PacificScorpaenidaeSmall 1.5" - 3"
Leaf Fish Scorpion Fish - Taenianotus triacanthus: The Leaf Scorpionfish has a very compressed body and a sail-like dorsal fin. It has a variably developed 'beard' of fine appendages around the mouth. The colouration of the Leaf Scorpionfish is variable, ranging from white, through pinks and reds to green. This species periodically sheds its skin. The Leaf Scorpionfish has perfected the fine art of mimicry. It appears at first glance to be no more than a piece of leaf or algae stuck on the coral as it sways back and forth with the current, but actually it is a supremely sharp ambush predator. Striking out at prey it finds drifting close by. 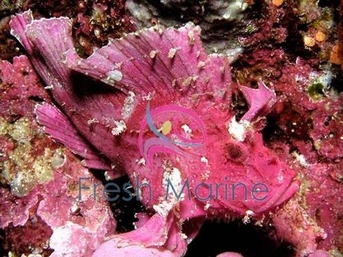 The Leaf Scorpionfish is a very pretty and colourful fish that is widespread in tropical waters. This species is monotypic genus meaning that it is the only species in the Taenianotus genus. The species is extremely good at camouflage and divers often do not notice it as it blends in so well with its background. Often hiding among corals and gorgonians. Algae and hydroids can grow on its skin, that it changes from time to time coming out as from a glove. Small Leaf Scorpionfish juveniles may drift down the Australian east coast on the east Australian current and settle in estuaries and harbours. Juveniles have been observed in the Port Stephens estuary on the NSW central coast and have also been recorded in Sydney Harbour. Maximum Size: The Leaf Scorpionfish grow upto a size of 25 cm. General Size: This fish is generally available in 5 to 8 cm. Minimum Tank Size: A 30 gallons or larger aquarium provides good environment for Leaf Scorpionfish. Tank Conditions: The Leaf Scorpionfish should ideally be kept in temperatures between 72 and 78 degrees Fahrenheit. A pH value of 8.1 or 8.4, and a specific gravity of 1.020 to 1.025 should be maintained. When kept with invertebrates, the specific gravity range should be 1.020 to 1.025, for the invertebrate species. In a fish only aquarium, the specific gravity should fall between 1.020 and 1.023. Habitat: It is generally found on coral reefs and can be sometimes found hiding in amongst the coral. The Leaf Scorpionfish has a widespread distribution throughout the Indo-Pacific. In Australia it is known from off north-western Western Australia, around the tropical north of the country, and south to northern New South Wales. Feeding and Diet: The Leaf Scorpion fish is a carnivore and likes to eat variety of chopped crustaceans, fish pieces, shrimp, shellfish, squid.